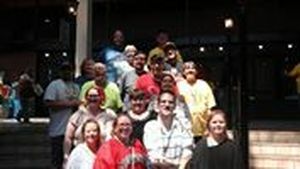 Self-Advocates across the state are organizing to learn and practice advocacy, serve our communities, and have some fun! Click here to find your local People First chapter. Click here for information on advocacy, how to organize a chapter and run a meeting, self-determination, inclusion, person-centered planning, advisor training, and PFN documents and self-advocacy products. Our annual convention is legendary! Click here for information about our next convention and pictures from past conventions. Funding is available for a limited number of PFN members to attend this historic conference. Registration, hotel, and transportation covered! eople First of Nebraska launched a public awareness campaign this year to let elected officials know that we belong in our communities. 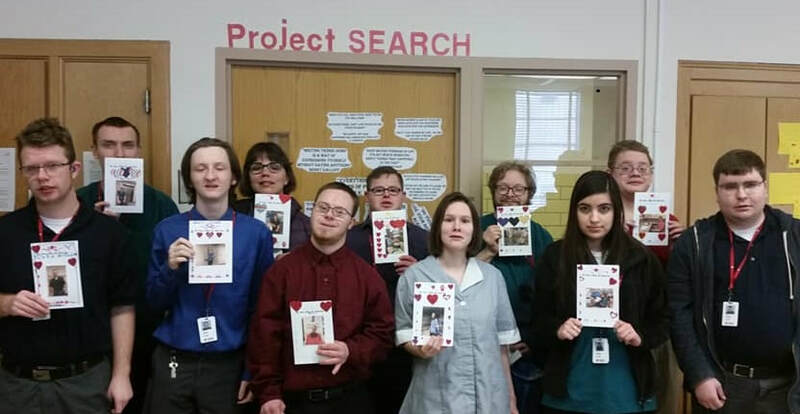 People First members and other people with disabilities are creating valentines that tell our stories. People share where they live, work, the time they spend volunteering in their communities, and what they love most about their lives. PFN's Disability Policy specialists have been delivering these valentines to our state senators. PFN members also gave valentines to Senators at the Arc Senatorial Dinner on February 20. Many of our senators don't know a lot about how people with disabilities live. 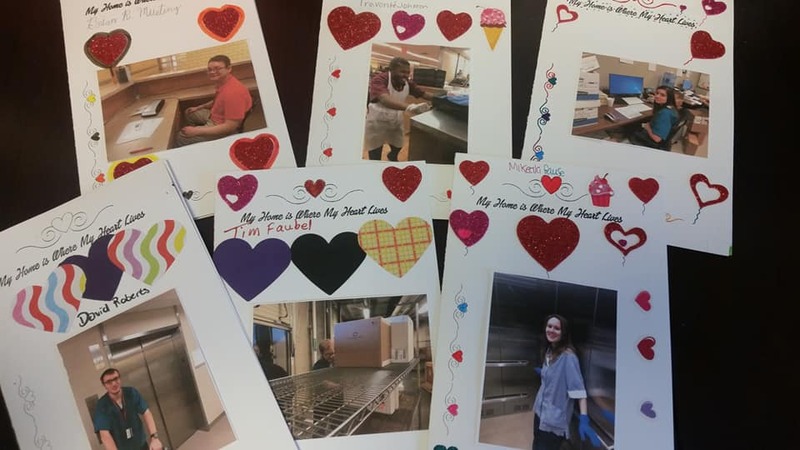 In addition to our stories, these valentines include pictures people with disabilities living in their own homes, working at their jobs, and enjoying events in the community. They also include facts about Nebraskans with disabilities. So far, we have created over 100 valentines. The campaign will continue through the end of the Unicameral session in April. If you would like to send valentines to your elected officials click here to download the template or make your own! Send your valentines to PFN at P.O. Box 5292, Grand Island, NE 68802 and we will give them to your state senator or aide. You can also give valentines to your local city council, mayor, county commissioners, or other decisions makers in your community. Let them know that Your Home is Where Your Heart Lives. Next, we visited our state senators and their staff to let them know about our lives, our dreams, and the supports we need to be successful in the community. ​ We also talked about legislation including funding for community supports, voter ID laws, and our opposition to the use of restraints and seclusion in our schools. People First members from Kearney and Grand Island meeting with the legislative aide to Senator Lowe. Courtney Miller, Director of the Division of Developmental Disabilities at the Nebraska Department of Health and Human Services answered questions about how funding for supports is prioritized by the division. In the evening, PFN members enjoyed the Arc Senatorial Dinner. Keynote speaker Andy Imparato, Director of the Association of University Center on Developmental Disabilities in Washington, DC, encouraged Nebraska to set ambitious goals and become a leader in the DD community. Julie Stahla (Left), PFN State Advisor and President of the Arc of Nebraska, presents an award to Senator Lynne Walz (Center) along with Edison McDonald (Right), Exec. Director of the Arc of Nebraska. Abut 80 Disability Advocates and Allies gathered at the steps of the state capitol and visited our state senators to let them know how important Medicaid is to our lives and how budget cuts will threaten our health. Several speakers talked about how Mediciad helps them live in the community and three Senators, including Senators Quick, Walz, and Krist spoke in support of keeping disability services funded. We made history in Nebraska ! Read about it in the Omaha World Herald! Beatrice Chapter First Ever Mini-Conference a HUGE Success! People First of Beatrice hosted a half-day mini-advocacy conference and a dance for self-advocates in March. "Many of our members can't make it to the state convention, so we are bringing the convention to them," said Lori Broady, chapter advisor. 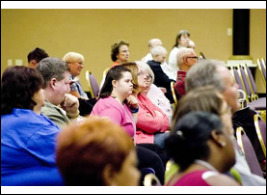 The conference will feature several sessions on different topics about self-advocacy, inclusion, and self-determination. Check out this great newspaper article about PF chapter founder, Hope Frey, and her journey to self-advocacy! 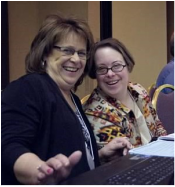 PFN and disability advocacy organizations in Iowa, Kansas, and Missouri are working together to enhance self-advocacy across the region through a grant from the Administrator on Intellectual and Developmental Disabilities. Each state has a steering committee made up of people with physical, intellectual, and/or behavioral health disabilities who are planning state activities for this 3-year grant. Each state also has co-leads that meet with leads from other states to build a regional network. Click here for more information on the activities of the Network. People First of Beatrice hosted it's Second Annual Mini-Conference on May 5, 2018. Attendees from several PFN chapters and the Beatrice area heard presentations on telling their stories, using the public library, dressing for success, the history of Cinco DeMayo, following your interests, and talking to policymakers. Later in the afternoon, attendees enjoyed fun networking activities and a dance. "Beatrice Police Officer Anthony Chisano was on hand with police dog Toro to give a glimpse into a K-9 Unit in law enforcement. Much to the delight of Toro, the presentation was followed by getting to be pet by all attendees. There were also a gaggle of therapy dogs on hand during the dance, ready to make new friends. An Irish setter named Murphy showed off his dancing skills while the other four dogs sat outside in the shade, happily being pet by attendees. Renee Harp, who came to the convention from Grand Island, is the vice president of People First Nebraska and will be representing the group at the national People First convention in Alabama in June. She was just picked to attend at the most recent board meeting and said she’s proud to represent Nebraska on a national level. 'I want them to know all over the country about People First of Nebraska,' Harp said. 'We're special people who can advocate for themselves.' "
Check out this great newspaper article about PFN President Travis Schaffer and his path to finding employment and self-determination. PFN elects new officers every three years. At our 2017 convention in October, the membership elected Travis Schaffer, PF of Norfolk, as our new president, Craig Schutt, PF of Kearney as treasurer, and Corice Lee, Project 2 (Omaha) as Sargent-At-Arms. At the 2018 convention, PFN members will elect a new vice-president and secretary. If you are interested in running for office, go to our Elections Page to learn more about the duties of each officer . You can also print a nomination form for you and your chapter to fill out. EVERYONE HAS LEADERSHIP SKILLS!! Current and emerging leaders within People First of Nebraska attended a leadership development retreat on July 14. Erin Stoll and Alisa Hoffman from Special Olympics presented on the 10 types of leadership skills. Everyone took a survey that identified their three strongest leadership skills and learned how to use those skills to advocate and to build their local chapters and state People First organization. "We envision a Nebraska where self-advocates speak for themselves; where the public and educational systems are more aware of disability self advocacy; where no one uses the "R" word; and where accessible public transportation is readily available." Once we had our vision developed, we broke into three teams to brainstorm about how to 1) Educate and Raise Awareness, Build new Chapters, and 3) Promote Advocacy through Leadership and Teamwork. On April 8, 2017, PF members from Fremont, Blair, Wahoo, and Omaha attended a one-day nutrition conference hosted by the Platte River Valley People First chapter. About 20 people learned about the importance of eating healthy, natural foods and how to plan our meals. Nutritionist Paula Sewell and Nancy Heller presented. Don't miss out on everything that's happening with People First of Nebraska! ​Your e-mail will be kept confidential. We won't share your e-mail address with anyone, ever!